GENTLE AND EFFECTIVE DETOX: Pure Body uses purified zeolite sized for superior absorption and highly effective detoxification. BODY AND DIGESTIVE LIQUID ZEOLITE DETOX: Supports enhanced digestion and gently detoxes throughout the body by simply adding 4 drops, 3 times a day to water. Toxins are the dirty little secret of the world we live in, found in our food, water, air and personal care products. Pure Body to the rescue. When properly cleansed and sized right, natural mineral zeolite helps remove heavy metals and other toxins safely and gently from the body. Pure Body is created using breakthrough processes that activate the natural detox qualities of mineral zeolite. With Pure Body it IS possible to reduce your body burden of toxins. With just a few drops throughout the day, you can fight back against fatigue, a sluggish metabolism, poor sleep quality, brain fog and the lack of energy that come from a daily barrage of environmental toxins. The zeolite Clinoptilolite has been grated GRAS status (generally recognized as safe) status by the FDA. Pure Body is 100% natural, non-toxic and safe for long-term use. Pure Body targets toxins in the digestive system AND throughout the body, thanks to optimal sizing that ensures absorption. This is a passive detox that is gentle and safe, with no digestive discomfort. Pure Body undergoes a proprietary cleansing process, removing pre-existing pollutants from the zeolite, so it effectively detoxifies. It is third-party tested in an independent lab to verify its purity. With over 300 studies listed on PubMed.org on the beneficial properties of the zeolite Clinoptilolite, this mineral has gained renown for its natural ability to trap toxins, heavy metals and environmental pollutants. Freshly mined, in its raw state, the mineral Clinoptilolite doesn't do much. Its crystalline structures are pre-filled with pollutants, and it’s too big to be absorbed by the body. Unfortunately, crushed up raw zeolite is what you’ll find in most zeolite supplements on the market today. That’s why we provide third-party testing validating the purity and potency of Pure Body. ONLY when processed and prepared correctly, there’s no denying the power of Clinoptilolite to attract and remove heavy metals and environmental toxins, safely and effectively, within 4-6 hours. Mined zeolite is often full of lead, arsenic and other environmental toxins. If the zeolite is already full, it’s not going to have room to trap the toxins found in your body. 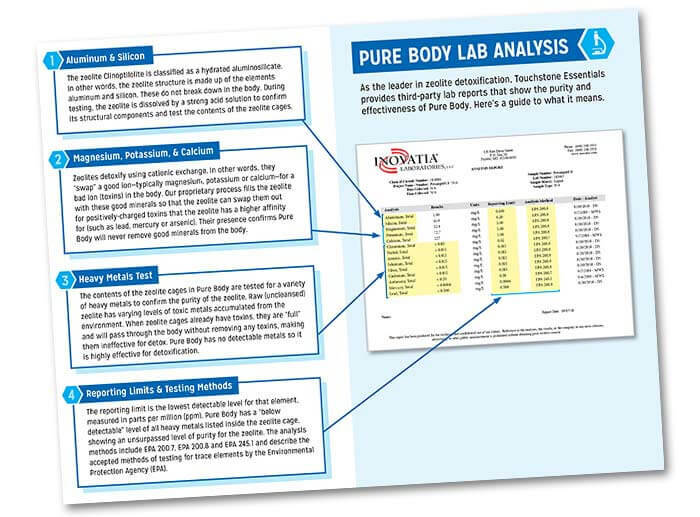 An independent certificate of analysis that includes a full assay of metals shows just how clean Pure Body is. Once micronized, zeolites can range from 10 to 40 microns in size—which will help detox your colon and little else. To get through the bloodstream, you have to go much smaller, which most providers aren’t equipped to do. Our particle size analysis shows Pure Body zeolite is sized for optimal absorption. Worldwide, scientists have conducted extensive research on the mineral zeolite Clinoptilolite. First identified for its ability to remediate wastewater, Clinoptilolite was later used in radiation removal (Chernobyl) and agricultural feed before being recognized for its detoxification benefits for humans. Pure Body is a natural way to detoxify your body of harmful heavy metals and toxins. With a concentrated liquid suspension of clinoptilolite zeolite and pure water, it is gentle enough for everyday use. Why is only Clinoptilolite zeolite used in Pure Body? To create an effective zeolite supplement, the zeolite cages of Pure Body are filled with exchangeable cations of calcium, magnesium, sodium and potassium. The zeolite particles are then placed in pure water for a liquid zeolite suspension, ready to detox your body. What special processing does Pure Body undergo? The zeolite in Pure Body undergoes a proprietary milling process that reduces the size of each of the zeolite “cages” so that the mean average of the zeolites is 0.3 microns, verified through third-party testing. 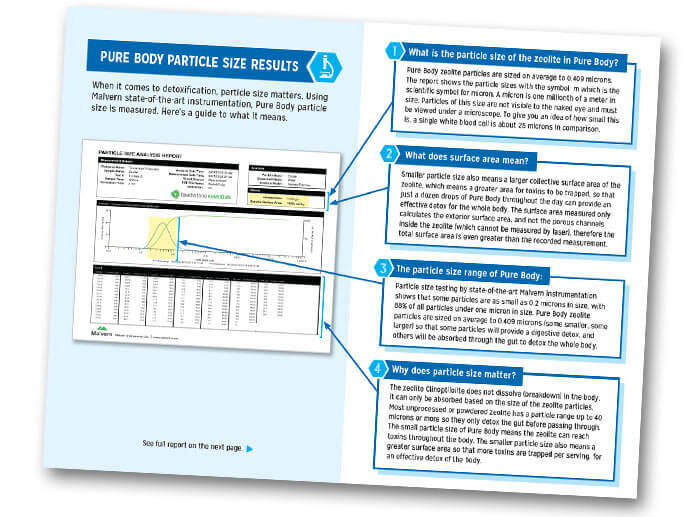 Pure Body undergoes a proprietary process to create a particle size of 0.4 microns (mean average) so the majority of particles are smaller than 0.2 microns for absorption via the small intestine, while the remainder proceeds to the colon. Why so small? Zeolites do not dissolve in water; hence they cannot use water as the absorption mechanism used by many foods and medications, and must rely on size alone to get into the bloodstream. The zeolite will stay active in the body for a period of approximately 4 to 6 hours, before being excreted through normal bodily processes. Given its short time frame in the body, the suggested serving of Pure Body is three times a day for optimal detoxification. What are the ingredients in Pure Body? There are just two… Clinoptilolite (zeolite) and pure water. Pure Body is preservative-free, gluten-free, non-GMO and is all natural. Can pets use Pure Body? Yes, all animals can benefit from the zeolite Clinoptilolite. Since pets are often directly exposed to heavy metals and toxins on pavements or pesticide-treated lawns, they can benefit from detoxification. Simply add drops to their water. Can pregnant women take Pure Body? Can children take Pure Body? Yes. The zeolite Clinoptilolite has been granted GRAS (Generally Recognized As Safe) status by the FDA. Reduce the amount of drops proportional to the child’s size. As a natural mineral, zeolites are not drugs. As a dietary supplement, Pure Body is not intended to diagnose, treat, cure or prevent any disease. Can I take Pure Body with my supplements? Pure Body does not currently hold kosher status. It is expected the certification process will be completed in the future. What color should the Pure Body drops be? Pure Body uses natural mineral zeolite, and the shading of the mineral can depend on microscopic variations in its mineral composition. Therefore, the drops may have anywhere from a beige, to light brown, to slightly green color. This is completely normal and well within the range for clinoptilolite zeolite.